CLICK HERE FOR A RECENT UPDATE ABOUT RAMI'S DEATH! MIND SOUP: Rami Chemali, the Lebanese star and Star Academy 7 participant, has passed away today at the age of 23 in a car crash in Cairo when vising his fellow Star Academy friend Mahmoud Shukri who is currently under intensive care. Shukri, an Egyptian, who was seated next to Chemali was also severely wounded in the accident . According to an eyewitness the accident occurred due to excessive speed. A car with 3 young people crashed into the car that was driven by Chemali, which resulted in the killing of Chemali and the 3 young Egyptians. May his soul rest in peace, and we pray to God to bring good health for Mahmoud. Below is the report televised by LBC on its evening news on Thursday. 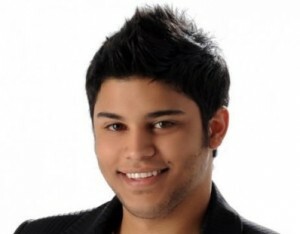 May your soul rest in peace Rami :'( His dream was to to win star academy but he didn't and he was okay with it. He doesn't deserve what happened to him. Poor Rami we will always love you no matter what. Alla yir7amak Rami <333 you are still yoing to die but thats what god wanted, at leat you are in a better place noe instead of being hurt :(. I hope Mahmoud gets out of the hospital safe and better :( we will pray for you too Mahmoud. God dont take them both away from us..
Allh yr7amo :( , may his soul rest in peace ..
God be with both of them, i hate car accidents and speeding :( . wallllah harammm! what is happening to this world...:( yaaa allah! andd is Mahmoud Shukri hurt very badly?? R.I.P. God gives the strength to his family!! :( Extremely sad. Speeding is just as dangerous as drunk driving or texting while driving. People need to learn how to drive before being allowed behind the wheel of a vehicle. Alla yerham albak habibe albe inta. Ya amar ya angel ya warde. So young and u didn't even start ur career. Its ok.. U will start it in a better place. In heaven becuase u r an angel. As for the egyptians get ur facts together becuase rami was not driving. Rami was killed. Stop trying to defend ur people at a time like this no one should be pointing fingers, we should be praying that everyone rests in peace and the ill get better.. But ofcource u woudnt know that.. Ur egyptians..
you were truly an angel sent from the heavens above and so now you are where you belong baby. its such a loss for us but its a gain where your at right now because people are lucky to be surrounded by such an angel like you. i love you so much and truly wish for you the best of ever-lasting life. i hope that God watches over your family and keeps them strong. everyone is lucky to have such a gardian angel like you. ..bas for sure it was known that rami was driving haram through the facts shown and heard about, and rami had died instantly, and mahmoud was in the passanger seat....anw, God bless them both, hope shukri gets bettter! and we know rami is in a better place! Rami you are truly an angel we love you so much god bless your soul. We will pray to all the saints above to give your family and specially your mum the strentgh in this hard time. Ramie you are in much better place. may you rest in pease rami !! and mitel ma bi 2oolo al a3mar bi yad el lah !! allah yerhamak. Rest in Peace Rami.. :(.. they say good die earlier n its true.. really sad, but you in a better place.. so please take care of urself.. keep smiling n shining.. watch over us my dear..